The L.A. Derby Dolls at a recent home game. This is going to be at RollerCon next week! To many members of the roller derby community, a banked track is like a real-life unicorn. You know they exist. You’ve seen them. You want to get on one. Once you do, you learn that the only thing you want in life is keep riding it, forever and again. Since RollerCon dropped the news that it acquired a banked track, the anticipation to skate it and see games on it has been through the roof. With less than a dozen tracks scattered in but a few lucky locations across the country, not many have been able to experience the sensation of flying around one or the pure thrill of watching a hotly-contested RDCL-rules game in person. That’s going to change next week. A lot of people are going to pop their banked track cherries all at once. That all games played on it will be exclusively between A-level skaters will make the experience even better. That’s getting a lot of people excited, especially those in the RDCL looking to interest leagues into getting banked tracks and getting more derbyfolk playing its style of the game. The track itself will be pulling double-duty, acting as a training track and a bouting track. The number of games and scrimmages on it will be very limited as a result, so you’re going to want to be sure your RollerCon itinerary includes a few stops by during the times the track is open for competition each afternoon. Depending on where you go home to, this may be your only chance of the year to see or skate on one, so don’t miss it! The full banked schedule, training class and open skate times, plus many other important details about the track can be found on the RollerCon website, here. You’ll especially need to check that out if you plan to skate on the thing. For the onlookers among us, here is the full competition schedule and some notable seminars and meetings that you may find useful. RDCL representatives will offer an open Q&A each morning by the track for skaters, spectators, announcers, or anyone else that wants to get up to speed on the rules differences between the RDCL and the WFTDA. Gameplay procedures, penalty enforcement, “double jammer down” situations, “Last Jam” rules, and more. A must-attend for anyone that wants to better understand how things work within the rails. The RDCL also has a daily meeting for officials that are experienced in WFTDA roller derby looking to go bi-traxual or poly-setual, getting more into the nuts and bolts of the rules differences between flat and banked play. An open banked track scrimmage at noon follows this seminar for some on-the-job training. Expand your referee street cred! Grab our Flat/Banked Rules Difference Guide! Don’t forget about the Roller Derby Notes Flat Track/Banked Track Rules & Strategy Guide, which charts out the major rules differences between WFTDA flat track, RDCL banked track, and USARS flat track roller derby, all of which will be played in Vegas throughout the week. We’ll be handing out a limited number of physical copies over the weekend, both at the banked track and during the USARS rules showcase at Track 1 on Saturday. If you haven’t already, download our expanded digital version now and get up to speed with the rules and strategies of banked track derby, before you even get to RollerCon. You’ll be smarter for it! Everyone skating in this challenge will more than likely be doing so in front of a packed grandstand. This being the first-ever banked track game at RollerCon, chances are good that people will be lining up early to get a spot to see it. RC organizers have indicated that there will only be 300 elevated seats around the banked track, so you may want to get there early yourself! This is the only other challenge on Day 1, and it’s the first of six where you’ll get to see the boys mix it up with the girls on the track at the same time. If you want to see a co-ed banked track game before the weekend rolls in, this is your best bet; it’s strictly ladies-only on Thursday. Along with the informal morning meetings, the RDCL is also hosting an open house with its Referee Director, Syphilis Diller of the L.A. Derby Dolls. This seminar is for questions that go beyond rules differences, about anything pertaining to the Coalition or banked track roller derby in general. Topics include “the good and bad of a new(er) organization,” how policy changes get pushed through a more fleet-footed body, and more. It’s a good opportunity for those in the community to get a different perspective on how things can work in the derby world, from league structure to game rules. Who knows? You may take away something that can help make better the derby you want to play! To paraphrase one Dr. Ian Malcom: This is the worst bad idea in the history of bad ideas. There is a good reason why banked track roller derby has its own specific ruleset1. When the idea to try playing WFTDA rules on the not-flat track was first floated, a few affiliated with the RDCL advised caution. Not just because of the added risks of clockwise skating on a faster and elevated surface, but the additional commotion that may come about as the result of real-time penalties, recycling, and referee traffic through an already-crowded infield. Despite this, RollerCon pressed ahead. Because why the hell not? At least it’s acknowledging the danger—with tongue in cheek. The track’s first full 60-minute game of the weekend will continue the theme of mixing the flat and the banked, except this time it’s pitting teams with differing dimensional philosophies against one another. Is flat track better? Is banked track better? Clearly, this is something that needs to be settled with roller derby. Fittingly, these two teams are sandwiching a full banked track game between two flat track challenges (Wednesday at 12:45 p.m. and Saturday at 12 noon, both on Track 1) to make things nice and fair. Makes you wonder what may happen if people take the time to watch the entire flat track/banked track saga unfold throughout the week. They may come to their own conclusions of who is the winner between flat track and banked track—despite the final scores! The captain of Team Fishnets is Erin Jackson of the Jacksonville Rollergirls. You need to know this because Jackson is one of the fastest roller skaters in the country, being a member of the USARS world inline speedskating team. Those that have seen her bolt around a flat track can attest to her raw speed. But put her inside the bullring that is a roller derby banked track? The last time she skated banked, Jackson was literally unstoppable as she took Jammer MVP honors on the way to helping her My Little Ponies superteam take the inaugural RDCL Jantastic Invitational six months ago. If you think you know how fast she is…well, you may be in for a shock when she makes a return to the banked track. Bonus: This challenge is co-ed, meaning she’ll be going up against some dudes that may be fast in their own rights. Those that don’t like extremely slow derby will probably find the extreme opposite of it in this one. If you only have time to see one banked track game at RollerCon this weekend, this one has the most potential to be the game to see. There is a hell of a lot of good skating talent, male and female, in each of these geographical regions. If the game-time rosters reflect a good percentage of it? Goodness gracious. 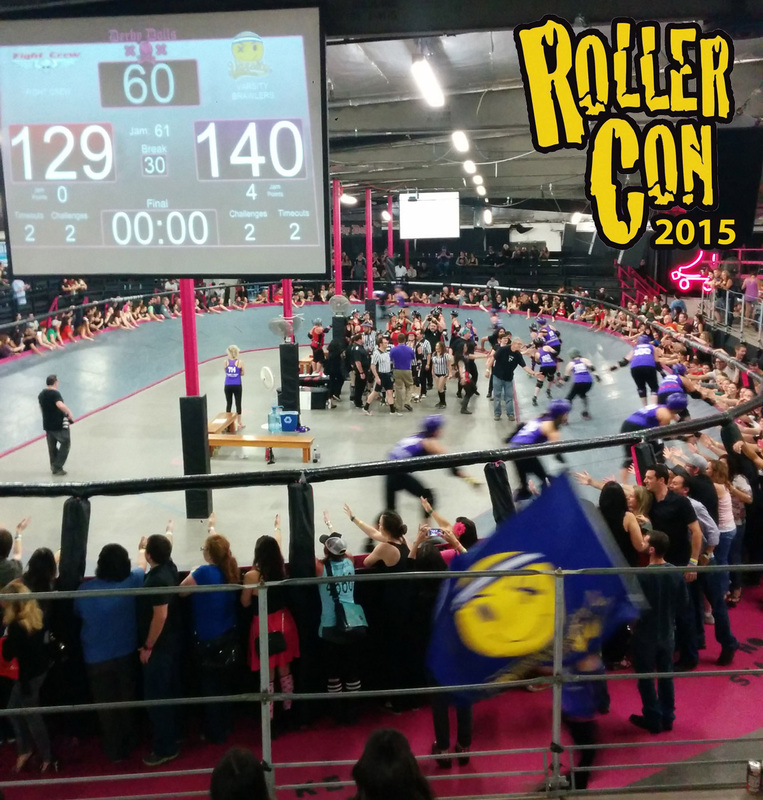 Plus, it’s the last of the three regulation-length RDCL games to appear at RollerCon. If you haven’t seen derby played in four quarters before, it’s now or never! Yup, that’s three co-ed challenges—and a reminder about that goddamn dress—to close out the competitive schedule for the banked track at RollerCon 2015. Speaking of that (the co-eds, not the dress) the number of boysngirls games on the bank—six, against nine for only the ladies—is surprisingly high. Co-ed banked track derby only exists at a recreational level in the RDCL, so it will be a learning experience for the Coalition to see what happens when the genders get mixed up in a higher-profile setting. In fact, this whole weekend will be new for the RDCL. It’s used to putting on events where teams have had time to practice the rules and players got an understanding the strategies necessary for success on the banked track. Here, a lot of skaters will be jumping into the frying pan skates-first, learning as the jams fly by. There’s the potential for things to get a wee bit sloppy, even with A-level skaters on the track. Still, as we will hopefully see on the bank, when things come together perfectly, the results can be absolutely spectacular—just like riding a unicorn. Or rulesets, since MADE roller derby can also be used on the banked track with a few modifications. Don’t forget about the USARS Rules Showcase bout on Saturday afternoon, which will plunge people back into the USARS flat vs. WFTDA flat debate. By the way, USARS has been wanting to see how its rule set works on the banked track. Maybe for RollerCon 2016? This game is extra-ironic. There’s no way for Team Dyslexic to skate backwards on the banked track!